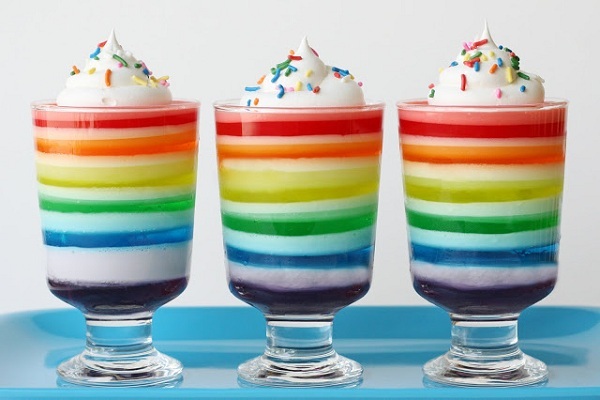 If the family has any patience left after making 30 something crafted Valentines, try this idea for rainbow-hued Jell-O cups featured over at Glorious Treats. You’ll need a lineup of different flavors, Cool Whip, and chocolate coins to assemble this lucky treat. Each layer needs to firm up for 15 to 30 minutes before adding the next layer, so you’ll also need to hold the attention of your brood for several hours –but the end result is worth it! 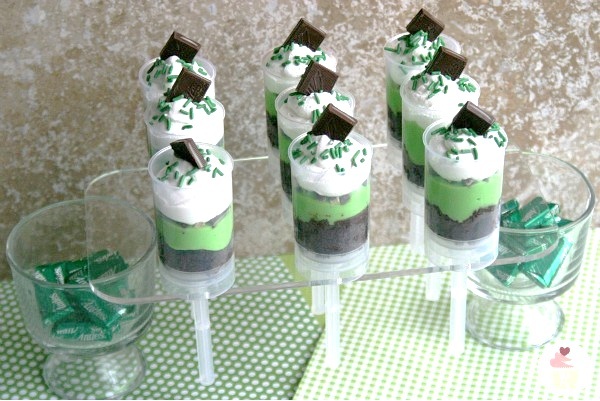 Here’s a “cool” idea for St. Patty’s Day push pops featured over at the Hoosier Homemade blog. The recipe calls for a few festive ingredients: minty brownies, vanilla pudding (plus, green food coloring), Irish cream coffee creamer, mint chocolate, and whipped cream. 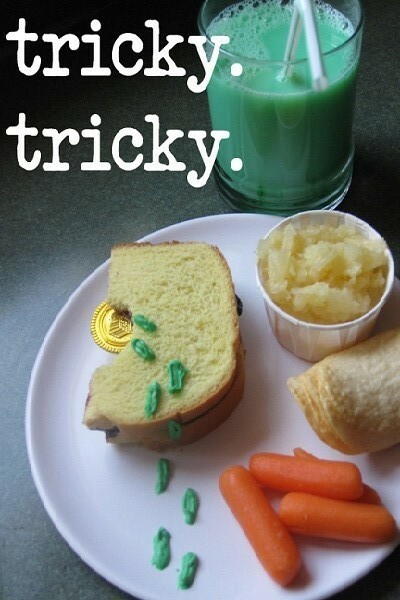 Layer up the sweets and you’ve got the perfect bait for the leprechaun with a sweet tooth. No push pop containers? Don’t worry – the layers look just as beautiful in a glass. 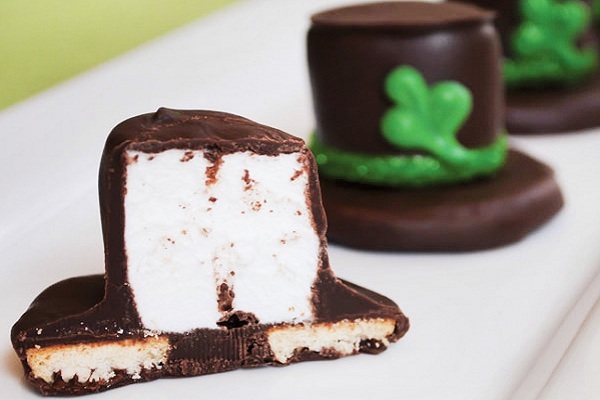 These leprechaun hat s’mores over at Hostess with the Mostest are so adorable, we squealed with excitement when we first saw them. Jumbo marshmallows? Yes! Fudge striped cookies? Please! Simply dip and decorate in chocolate and green candy melts and you’ve got sweet little hats for your little ones. Head over to the full post for the DIY tutorial, plus tips on how to make the sparkly shamrock embellishments. 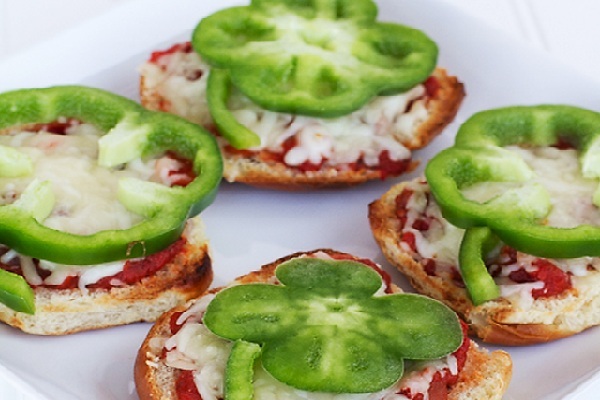 Make lunch a little luckier with this St. Patrick’s Day treat featured over at Gourmet Mom on the Go. A few strategically placed frosting footprints and a hidden chocolate coin take lunch away from the ordinary. With some green-dyed frosting and a Ziploc baggie, Mama Mandy makes it easy on us wait-‘til-the-last-minute-almost-forgot-to-wear-green moms. Lucky Charms cereal is St. Patrick’s Day MVP. 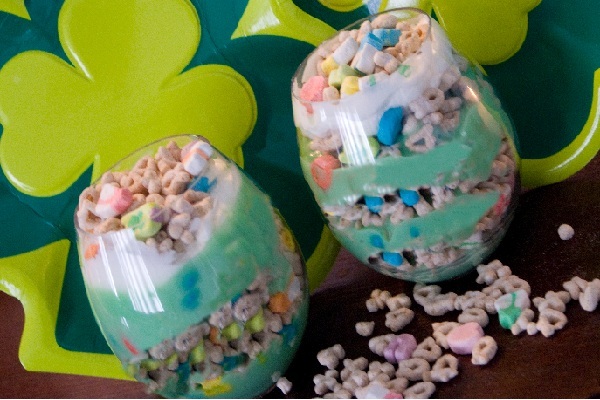 You can make Lucky Charms marshmallow treats, or even use the mini-mallows as cupcake toppers. But we love this lucky trifle idea featured over at Frilly Fabulous. 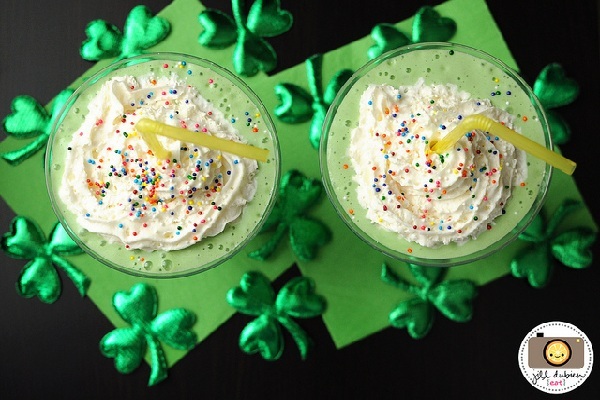 Made with layers of yogurt (leprechaun green!) and Lucky Charms, you could even present this to kiddos as “dessert” for breakfast. Tricky, indeed! It’s an edible ROY G. BIV display for St. Patrick’s Day! This idea at San Diego Cooks features strawberries, clementines, pineapple, green grapes, blackberries, and purple grapes – a lovely rainbow centerpiece for your St. Patty’s Day table. 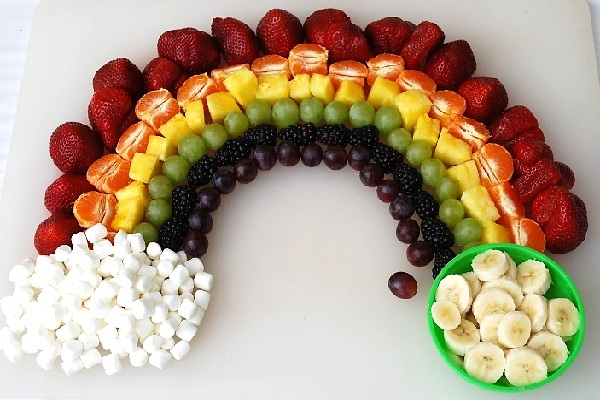 Mini-marshmallows form clouds on one end, and sliced bananas are a leprechaun’s loot on the other end. So clerver-ly clever! 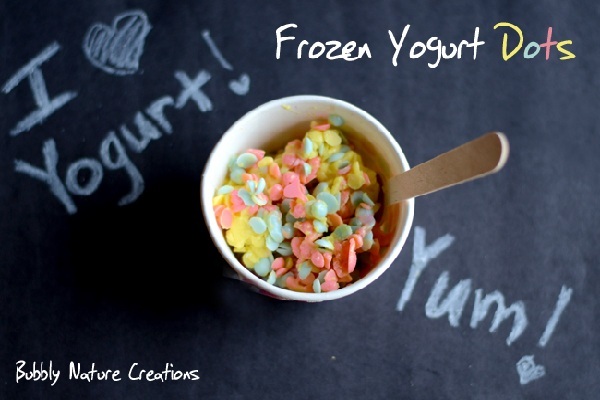 Oh, we’re in love with the idea for these frozen “dots” featured at Bubbly Nature Creations. Unlike the popular ice cream version, these cuties are made from colorful frozen yogurts. Simple and healthy! Mama Rachel uses a pastry bag and tip to crank the dots out onto parchment paper. (Little shamrock or coin shapes for St. Patty’s Day would be fun, too!) Pop the sheets into the freezer and you’ll have a healthy snack that your little leprechauns will scoop right up. 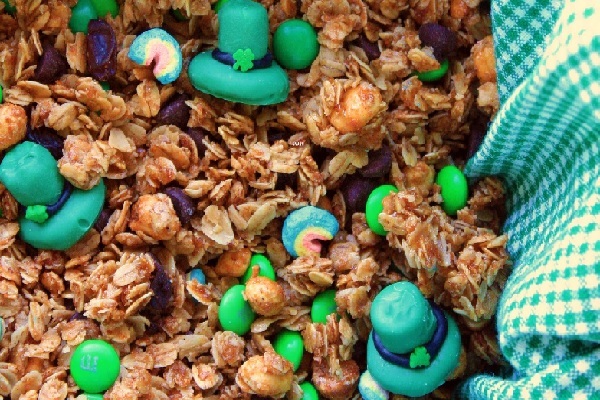 Those pesky little leprechauns have been rolling around in the granola again! Give the kiddos a surprise with this idea for miniature hats featured over at Munchkin Munchies. The post also includes a foolproof fruit and honey trail mix recipe. The hats are shrunken versions of the other hats featured in this article (this recipe uses mini-marshmallows and mini-Oreos instead). Lucky Charms rainbows add a little extra sweetness, too. Spoiler Alert: This fun idea for mini pizzas over at Blissfully Domestic is super easy and healthy to boot! Shhh…don’t tell your picky eaters that the lucky shamrocks are really veggies. Hamburger buns, marinara sauce, mozzarella cheese, and green peppers are all you’ll need. Who doesn’t love a good pizza pie? This article was updated on Feb. 1, 2017.